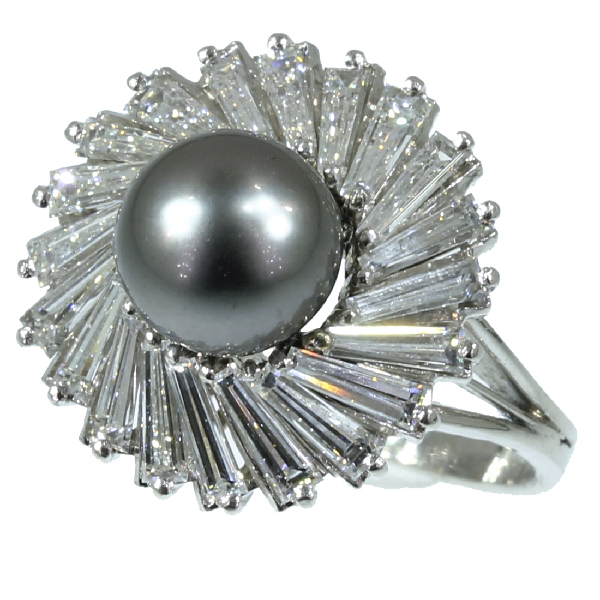 Exceptional platinum estate ring with tapered baguette diamonds and black pearl: Description by Adin Antique Jewelry. Every element of this astonishing platinum Estate ring is in harmony with one another. A colossal black pearl ascends from the white shimmer of 20 tapered baguette cut diamonds azure-set in an illusion of an upward spiral. And how the rounded prongs remarkably complement the circular shapes as well as the rectangles. With this ring, everything is just the way it should be. Diamonds: 20 tapered baguette (long rectangular) cut diamonds with an estimated weight of approx. 3.50 crt. Total diamond weight: approx. 3.50 crt. Birthstones: Diamond is the birthstone (or month stone) for April and pearl for June. Resizing: Free resizing, but because of the the way the ring is made, we cannot guarantee to make it on every size; so please ask in advance (only for extreme resizing we have to charge).